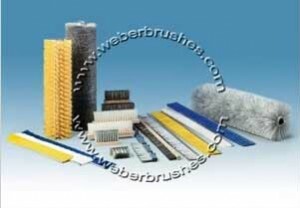 Our brushes for concrete are high quality, German-made products supplied by Weber Burstensysteme. As the only factory-authorized reseller of these genuine concrete brushes, ISI is the only place to source these superior products for your business. In the industry of concrete batching and production, it’s important to keep your machinery in proper working order. In short, this means keeping machines clean and clear of caked on concrete through the usage of brushes. Whether you need pallet cleaning rotary brushes, feed box strip brushes, or something a little more specialized, ISI is here to help you protect your investment. 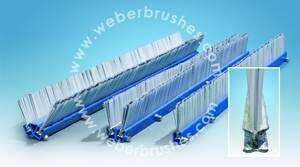 All common specifications and sizes of brushes are in stock and we can ship on short notice. If we you have a unique or uncommon request for a type or size of concrete brush not commonly found, we can still help. Give us a call today! Why Use ISI for your Concrete Brushes? Here at ISI we work with, and source, only the highest quality concrete brushes and concrete production equipment in the industry. As such, our clients have come to rely on us as a trusted source for all their concrete brush needs. If you have any further questions about our full offerings of brushes for concrete, or would like to place an order, give us a call today!